Nearly 30 years have passed since the last Winnebago travel trailer left the plant in Iowa and headed down the American highways. Since then, Winnebago has focused on producing superior motorized products and has made the name "Winnebago" synonymous with the modern day motorized recreational vehicle. In December 2010 it was announcement that Winnebago Industries would soon return to the towable segment of the market. Extensive research and careful consideration by the Winnebago Management Team concluded that this ground breaking venture should be located in Elkhart County, the heart of the RV Industry. Winnebago of Indiana, LLC is now located in Middlebury, Indiana and building the most exciting product to hit the market in years. 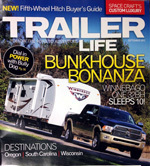 We are pleased to introduce the new Winnebago Towables travel trailers and fifth wheels to our product offerings. The Winnebago name is the most iconic name in the RV industry signifying quality, innovation, and durability. The all new Winnebago Towable division has set a new standard for the industry. 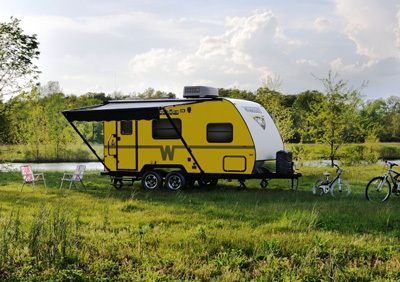 The Winnebago Towable features several structural advantages over the competition. Starting with the extruded I-beam frame, the Winnebago One and Winnebago Lite 5 fifth wheels are built on the strongest frame available yielding a rock solid foundation that will easily handle all the bumps the roads have to offer. The six sided aluminum cage construction offers superior strength while keeping the unloaded weight to a minimum. Many manufacturers use a cheaper perimeter aluminum frame construction with wood or thin galvanized steal truss roof support. The exterior shell is constructed with actual gel-coat fiberglass sidewalls, not cheap fiberglass re-enforced plastic (referred to as Filon) that is weaker and more difficult to repair. Looking deeper, you won't find any particle board or structure board in a Winnebago One or Lite 5. The Winnebago Towable Series use high quality plywood for roof decking and floors. Additional features include: slam latch baggage doors, heated enclosed underbelly WITH an actual heat duct AND return vent in the basement area, convenience utility center, solid cherry cabinet doors, aluminum fender skirts, and memory foam mattress. 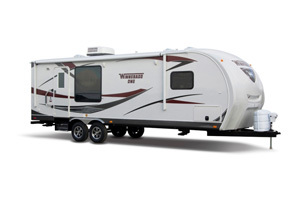 The Winnebago Minnie travel trailers offers many features in a small package. With optional high gloss colored gel-coat exterior, the Winnebago Minnie is sure to set you apart from the crowd. Choose from lemon yellow or bright green and watch the heads turn as you drive by. 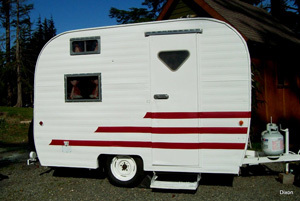 But don't worry, if that's not your style Winnebago Minnie travel trailers come in traditional white exterior too. 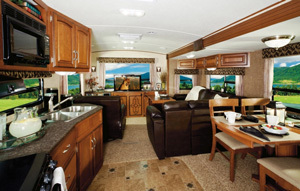 To learn more about the Winnebago Towables, please contact Fretz RV. We are a proud recipient of the prestigious Winnebago Circle of Excellence award. Please call us, our knowledgeable staff will be happy to answer any questions you might have.